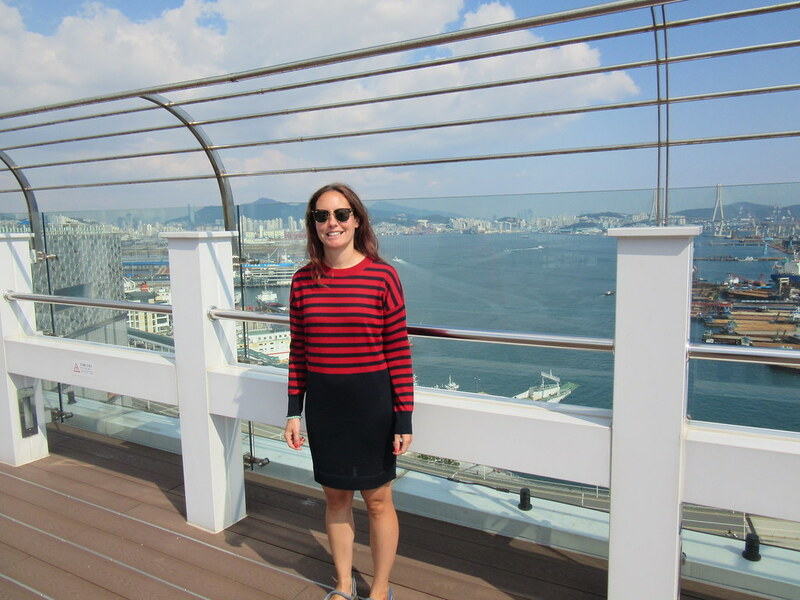 We had a rough idea of where we were going as we’ve been to Busan before and we’d booked a motel near the ferry port, but once we got into the general area, we were a bit stumped. Suddenly we couldn’t read anything anymore. In Japan, although we couldn’t read everything, we could make out the majority of what we needed. But here, the Hangul script was completely alien, so we couldn’t make out if places were hotels, offices, or God knows what else. Luckily, in Korean cities, free wifi is everywhere, so we were able to find where we were supposed to be and got into our room. 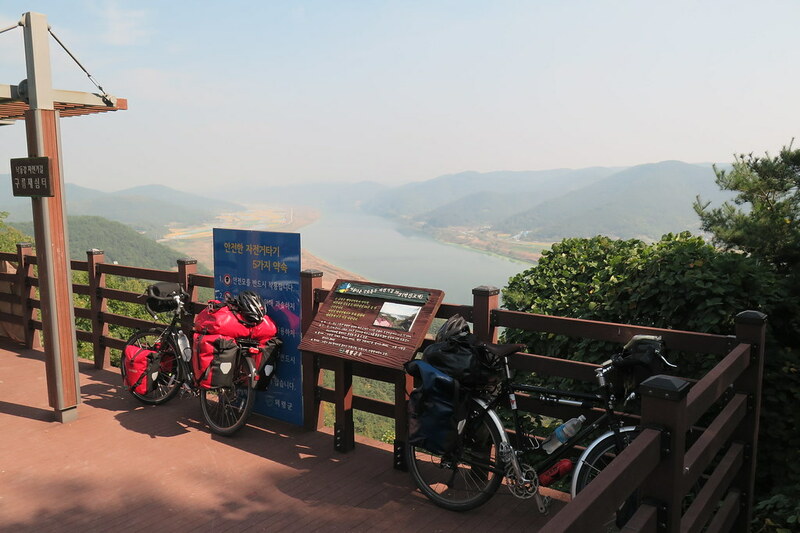 We had a rest day in the city when we had a wander round and found a bit of info about the 4 Rivers cycling trail that we’d be following up to Seoul. 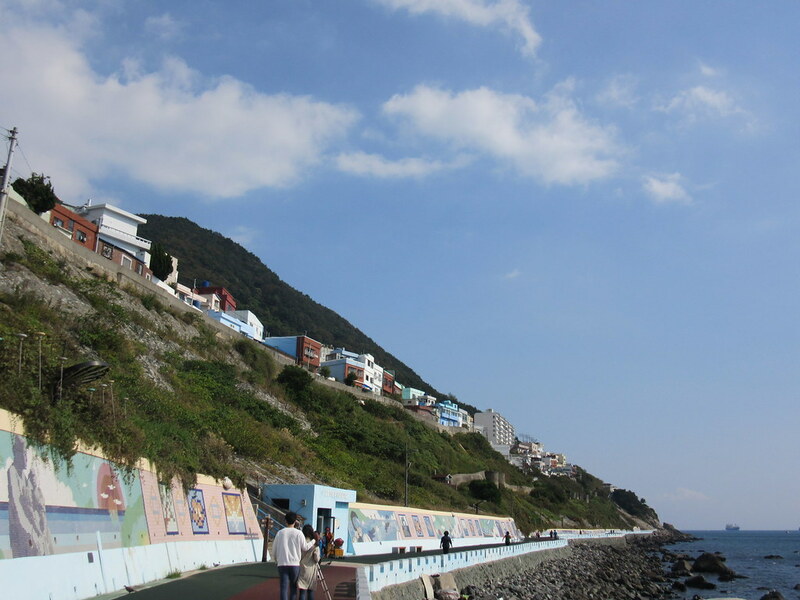 We also went to have a look at a place touted as Korea’s Santorini. Not that we’ve been to actual Santorini, but this definitely didn’t live up to the hype. It was a nice walk through the city and around the harbour though. The following day we were up and getting ready to leave when I went out to the motel’s balcony where our bikes were stored. Clare’s front tyre was flat, again. She’s had a couple of flats since we left Tokyo a few weeks ago and despite spending a lot of time checking the tyre, we haven’t been able to find out what’s been causing it. I rode down to a bike shop nearby and asked them to have a look at the tyre and rim to see if they could spot the problem. But they couldn’t see anything, so I repaired the tube and bought a spare tyre to carry with us. 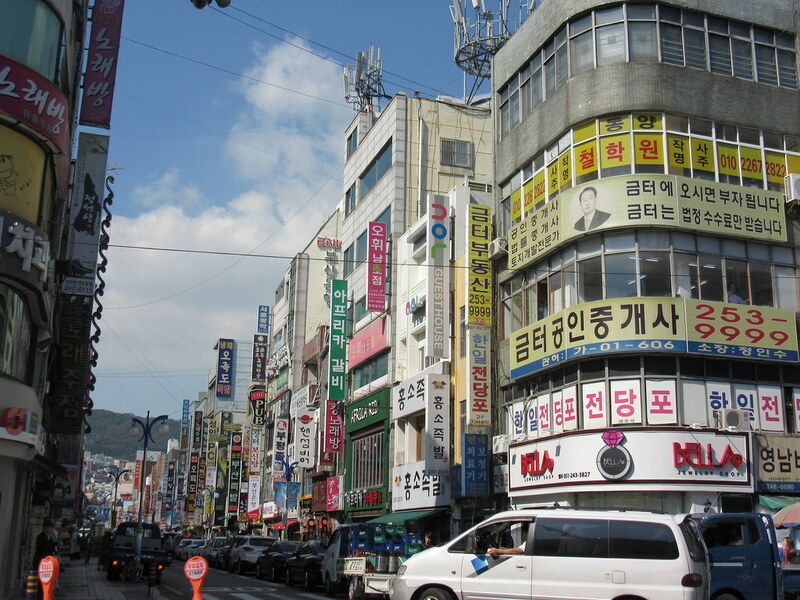 Heading out of Busan was a bit of a headache. We had to cycle across town to get the the start of the cycle path which took us up and over a big hill, and along a busy trunk road. We were riding on the other side of the road for the first time too. It took us over an hour to ride the 10km or so, as it was a Saturday and traffic was heavy. 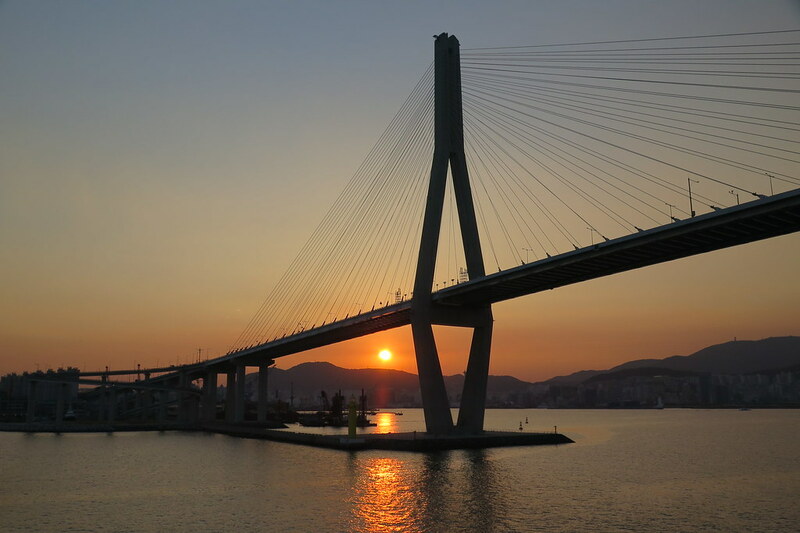 At the Nakdonggang Estuary, there is the Busan terminal and ‘certification centre’ for the 4 Rivers Path. There is a cycling passport system whereby you collect stamps from stops along the route and once you’ve completed the various courses, you get a certificate or a medal. 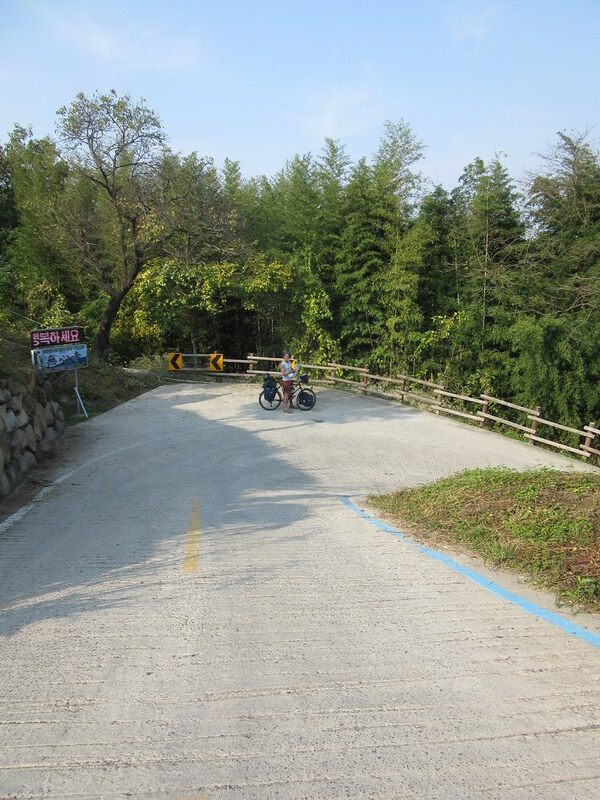 As there’s a medal up for grabs for completing the cross country route to Seoul, we were well up for it. Anything for a medal! So we picked up our passports, got our first stamps and set off north on the cycle path alongside the river. 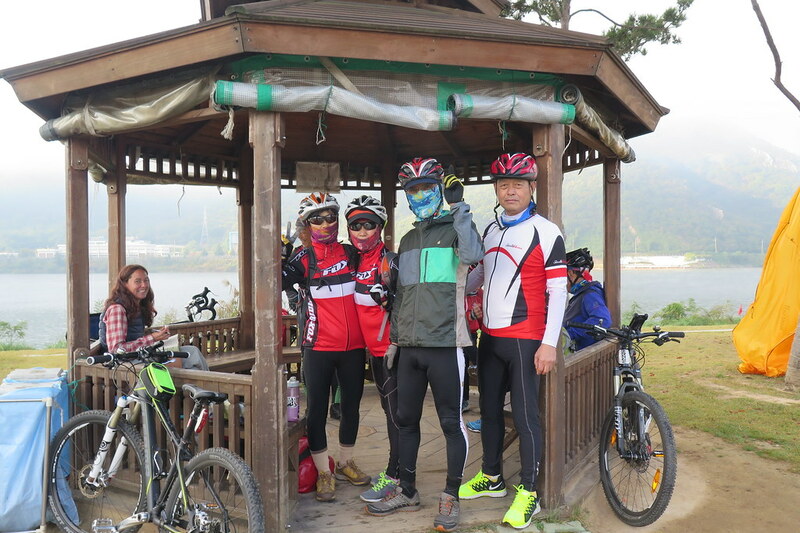 Koreans love to cycle! The path was busy with cyclists, almost all on brand new looking mountain bikes. 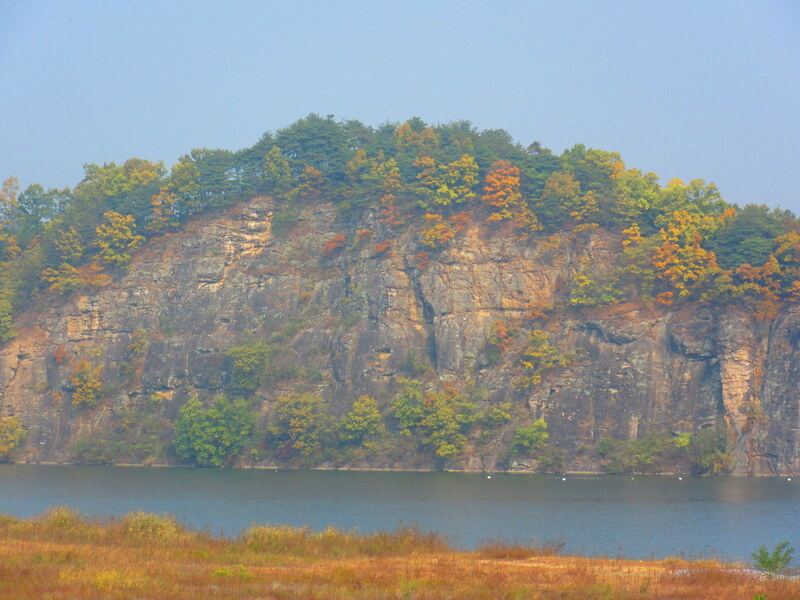 Last time we were in Korea and did some hiking we noticed how well kitted out all the hikers were with technical outerwear and full on hiking boots, even on mellow footpaths. The same was true with the cyclists – all wearing lycra, branded cycling kit and weirdly, facemasks covering their faces below their mirrored sunglasses and helmets. It was pretty weird exchanging waves and hellos with other cyclists when we couldn’t see their faces at all, but everyone was super friendly. 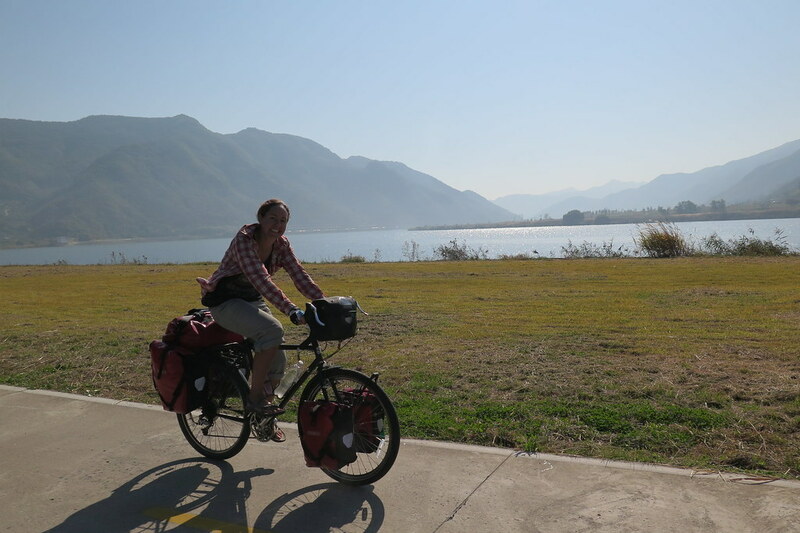 And despite the fact that a lot of other foreign cycle tourists travel this route, indeed we know of several that are doing it right now, most people looked shocked to see us loaded up with our panniers. The riding was good fun and very scenic once we got out of town. 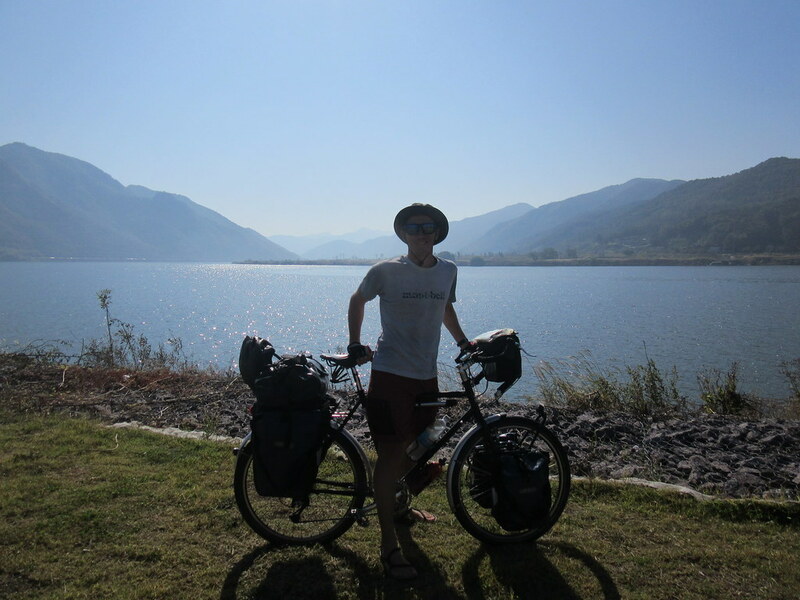 On our first day we only covered 43km, getting us safely away from the city and into the hills to a nice rest area on the path near Yangsan, complete with water, toilets, and a couple of food vans. Once we’d pulled up and unloaded the bikes, everyone was interested in coming over to have a look at what we were carrying and to ask us what we were up to. Very few spoke any English, and of course we speak no Korean, so there were a lot of gestures! The path was busy even well after dark as cyclists continued coming past with powerful LED lamps on their bikes. Once we’d pitched our tent we were undisturbed and left to get on with it. 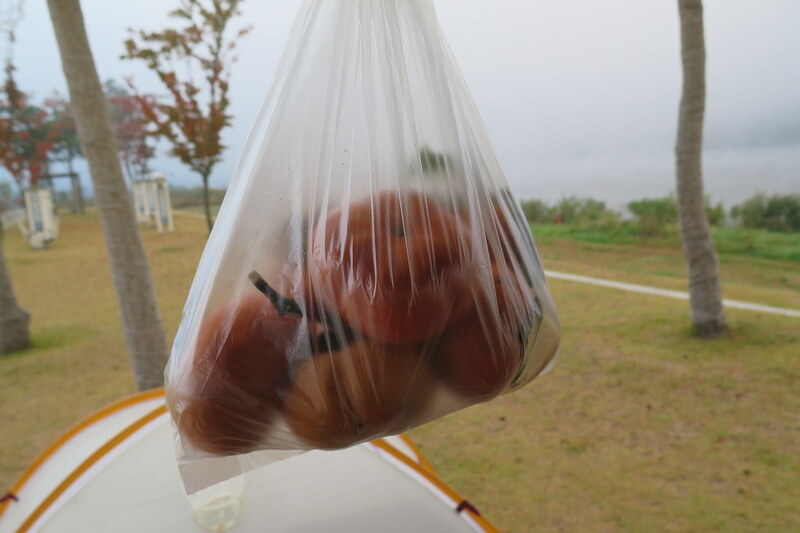 Until one of the guys we’d been speaking to earlier came back in his car to see us, with a big (and heavy) bag of persimmons from his garden. Thanks Mr Park! Getting out the tent the following morning, we could barely see anything! The fog hanging over the river was so thick that we couldn’t even make out the opposite river bank. Thanks to the fog, our tent was covered in dew so we sat around for a good while waiting for the sun to appear and dry things out. 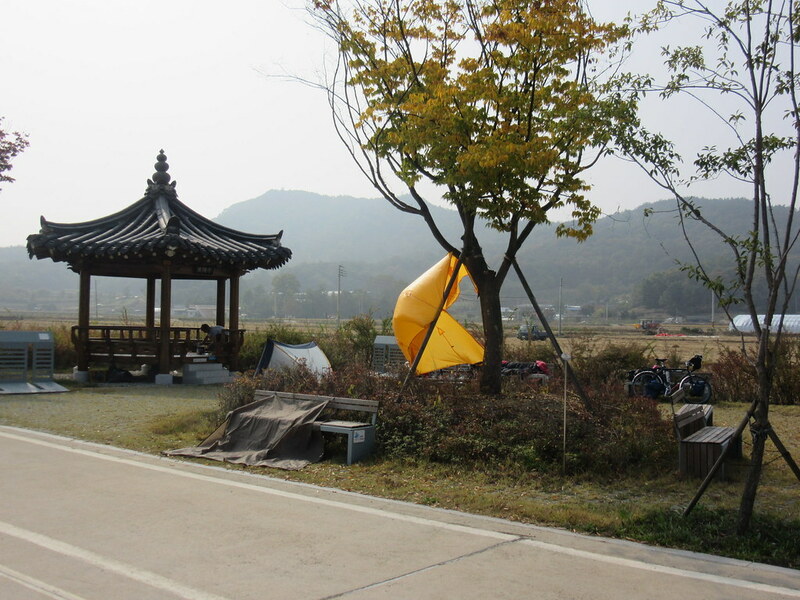 While we were sitting, a constant stream of cyclists came past and sat with us, offering us fruit, chocolate, eggs, coffee and one guy even gave me a cup of makgeolli, a Korean alcoholic drink. With the tent not quite dry but keen to get moving, we set off a little after 9 to continue north. 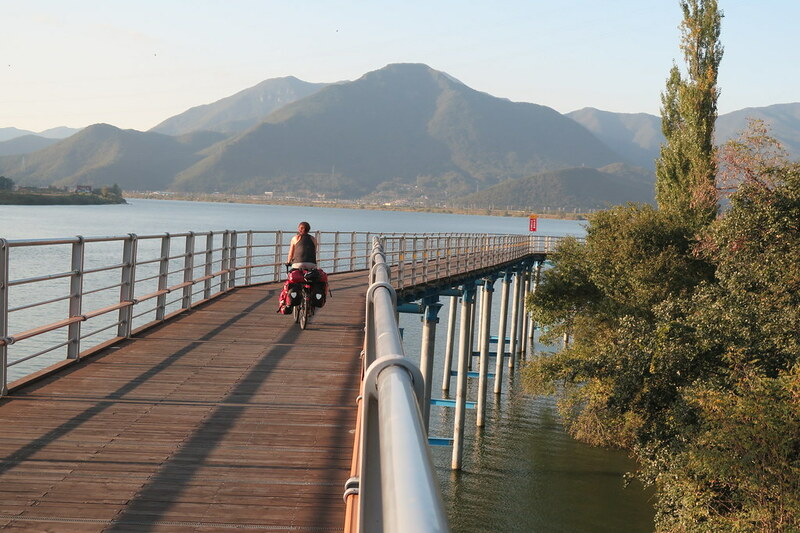 The riding continued to be really enjoyable on well maintained paths following the riverbank. The river wound its way through the mountains giving us great views. We had a bit of headwind which slowed us down and we had quite a few food and photo stops along the way. We were in no hurry though and had a mellow day, getting to just over 60km. 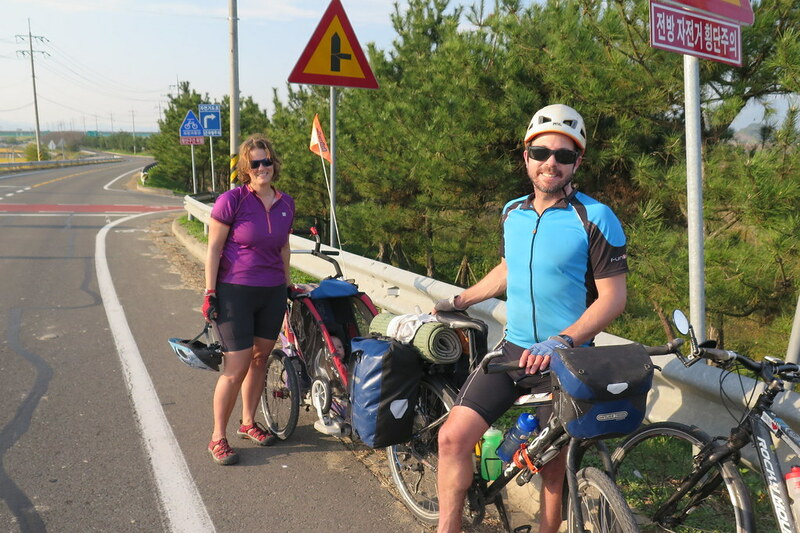 Just before stopping for the day, we passed a family from Canada, cycling in the opposite direction. 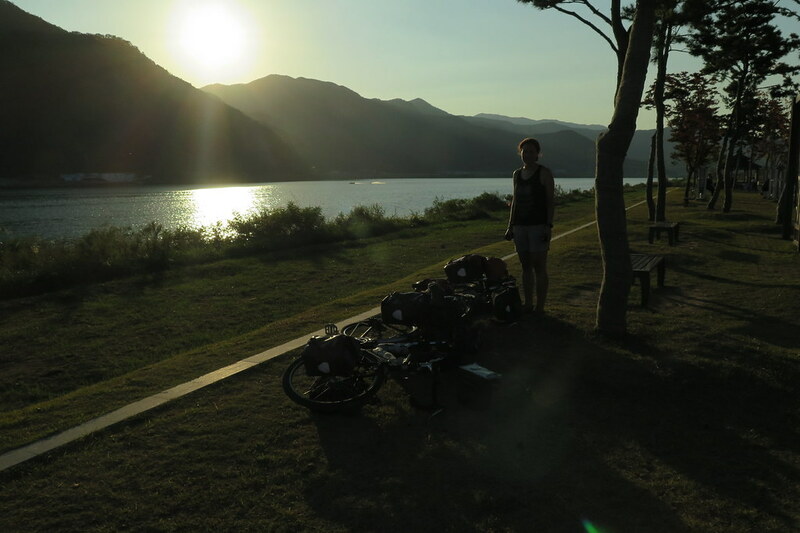 Gili and Maya are travelling by bike for 3 months through Korea and Japan, towing their 8 month old boy in a trailer behind them! Very impressive! We reached a campsite that was emptying out as it was a Sunday evening. We didn’t really know if we needed to pay, or if it was a free site, as there were no prices on display. We stopped at an empty pitch in a quiet corner of the site and sat for a while to try and suss things out. A guy came over to talk to us, but of course, we couldn’t really understand what he was saying. Either way, he seemed pretty cheerful, slapped us (quite hard!) on the back and made it clear that he was happy for us to stay there for the night. Maybe we were smelling a bit fresh too, because he made sure we knew that there were free showers available! 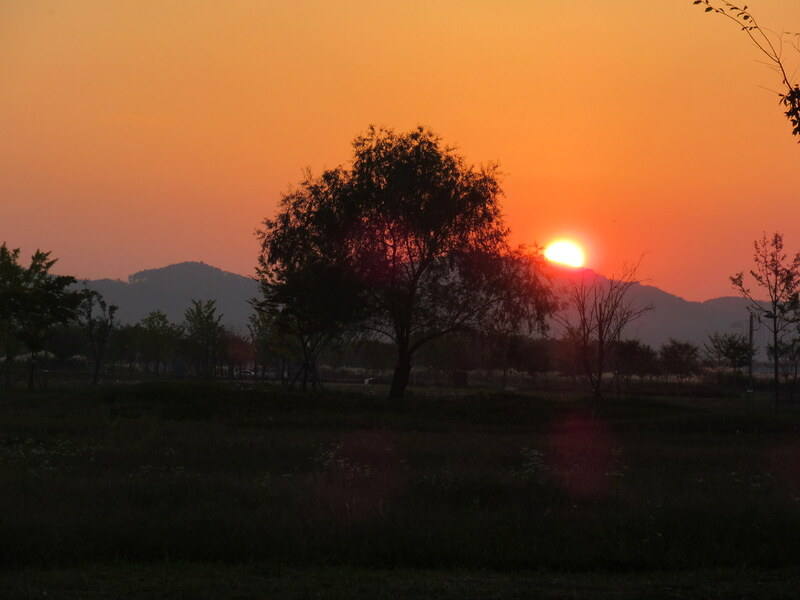 We enjoyed another great sunset as we set up the tent and cooked dinner. The site had free wifi too and power sockets everywhere, perfect. 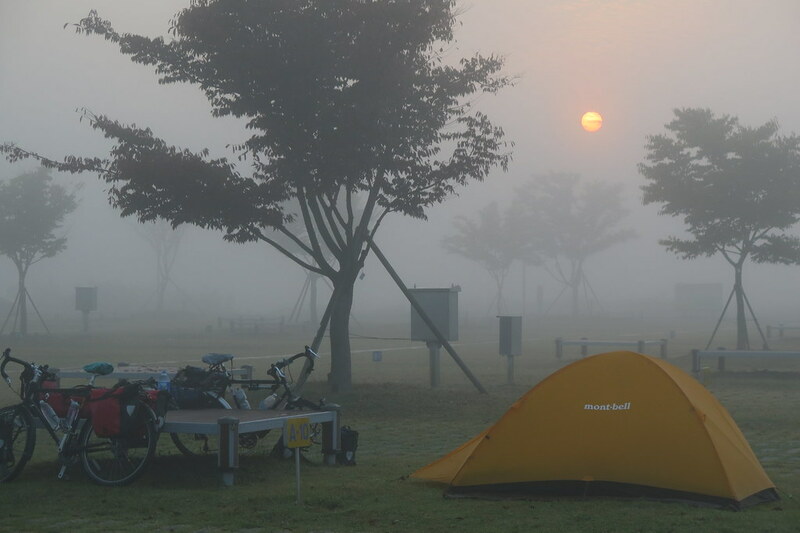 Another very foggy morning the next day which slowed us down as we waited for the tent to dry off. Again it was around 9 when we set off. We left the security of the path early on to dive off into Haman town to get some food for the following days. The path is great and a very easy way to travel, but it does separate us from the real world and useful things like shops! Up till now, it had been largely flat but today we started to experience some of the steep hills we’d heard about! They’re not necessarily long climbs, but some of them are unbelievably steep. It made the going quite tough with our heavy bikes! I’d also heard about the path splitting, one way going on an off road course for mountain bikes and the other for road bikes. Unfortunately, we missed the sign for the split and ended up heading towards the off road course. As it was getting on for the end of the day, we weren’t going to tackle the long dirt track, so opted to back track on the smooth concrete adding 10km to our day. As it was getting dark we got to a spot that looked good to camp so we pitched our tent under a shelter next to a quiet stretch of the path. 81Km for the day, even if some of them had been in the wrong direction! After a good sleep in a quiet spot, we got up the next morning and found Clare’s tyre flat again. We decided to swap over to the spare tyre that we’d been carrying and put in a new tube to make sure that we wouldn’t have any further problems. Or so we thought. 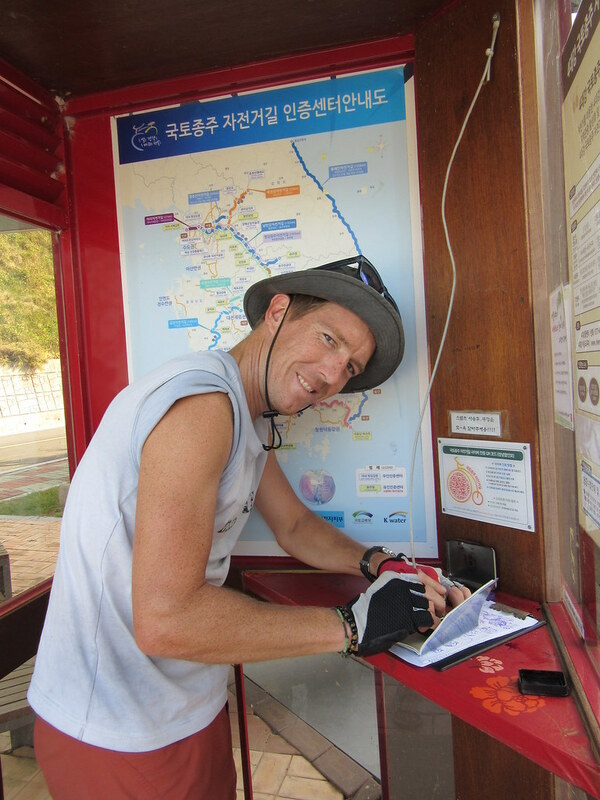 We had a good morning getting us to Daegu city by lunchtime with the all important check point and passport stamp. We went to a small bike shop to buy a couple more spare tubes and had some lunch. When we returned to the bikes ready for a good afternoon, the tyre was flat again! Beyond frustrating. So we headed further into the city to a decent looking shop who spent a good while looking at the rim and assuring us there shouldn’t be any more problems once we’d changed the tube, again. The language barrier was a problem as we tried to explain the problems we’d had. The guys in the shop were really nice and wouldn’t accept any payment for their time, but we still weren’t feeling confident when we rode away to continue the day. By the evening we’d clocked up another 35km and got to the next checkpoint. That carried us over the 3,000km total for the trip. 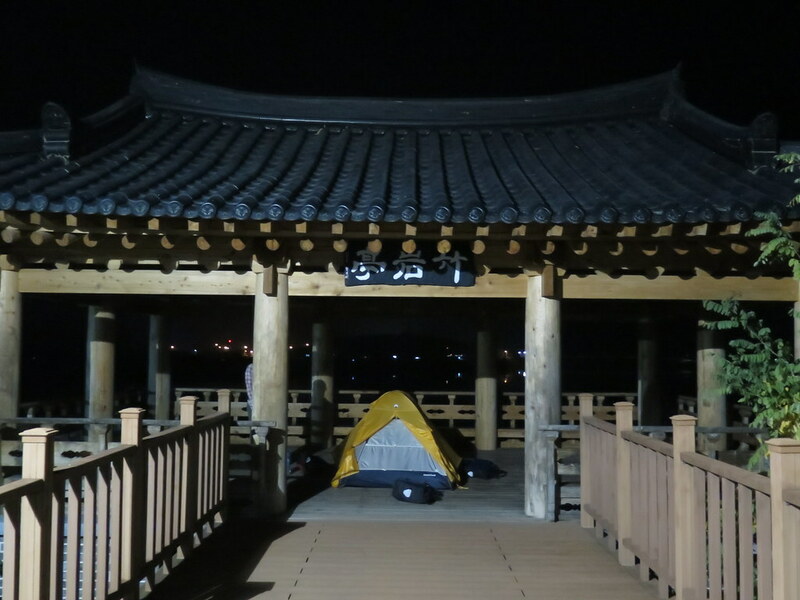 We pitched our tent in a park in Chilgokbo hoping that the tyre would still be firm in the morning. Which it was. Awesome. ‘No worries Wednesday’ coming up! The morning was great, foggy to start, as usual, but with the sun coming out eventually. 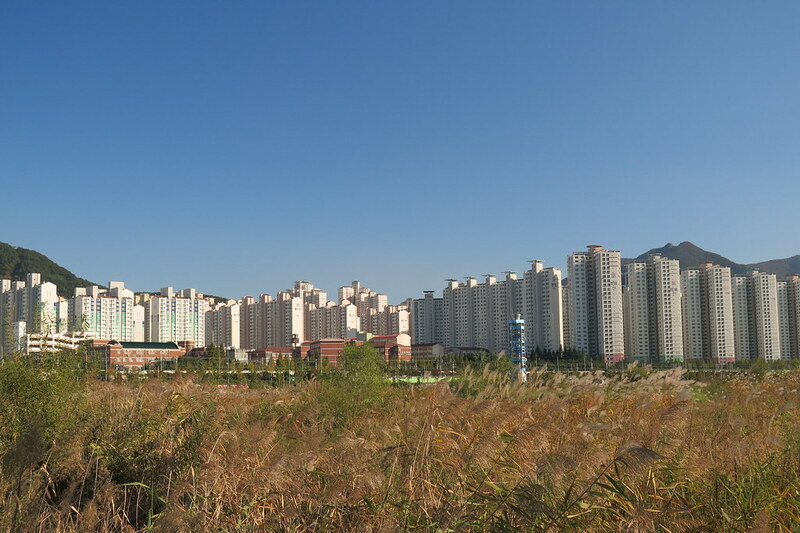 Initially we were riding though quite a large industrial city with a huge LG Electronics factory. 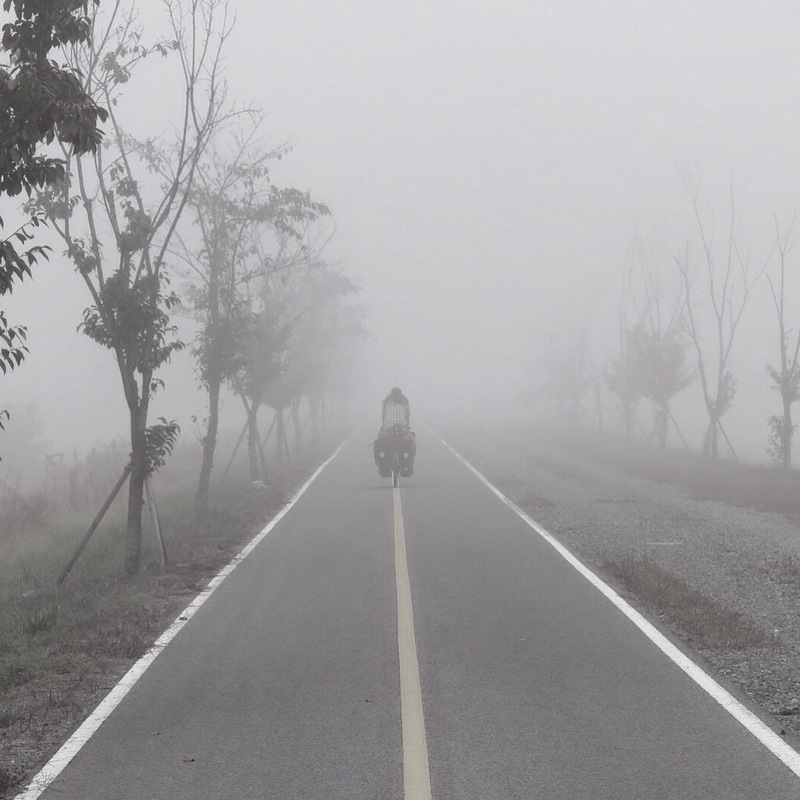 (I have no idea what it’s called – the joys of just following the cycle path!) But then we were out into the countryside again, still following the river through hills covered in the beginnings of the autumn leaves. After 55km, we had a lunch stop in a pavilion in a really quiet area and got our tent out to dry as we’d left that morning before giving it a chance to dry fully. As we were enjoying our lunch of noodles and taking in the view, there was a bang, and a hiss, and Clare’s tyre was flat again. Many expletives and more time wasted. This was a big hole in the tube, which must’ve been caused by the rim or spokes. We checked the rim tape yet again and changed the tube to try and limp to the next town to get this thing sorted out properly. Another puncture 5km further down the path and another tube which got us to the next checkpoint where we hoped we’d find a bike shop. We didn’t, but we did find a beautiful spot to camp for the evening and some really helpful people who tried their best to help us. Luckily, one of them was a Japanese woman living in Korea so we were able to explain our problem a little better. They made a couple of phone calls and said there was a bike shop that could help us, but it’d mean backtracking the next morning. When we woke up, the tyre was still firm and we decided to push on to the next town as we really weren’t keen on the idea of going back. It was the gamble of a known shop in a town behind us, versus a larger town up ahead with possibly a decent shop. 5 km in we had another flat, so we used the ever reliable duct tape to layer over the rim tape, hopefully giving us a bit more protection. Gingerly, we headed on towards the next checkpoint. The scenery was really gorgeous and the autumn leaves were vibrant so we tried to enjoy it, even though we both were on edge hoping that we wouldn’t get another puncture. Luckily our duct tape bodge job held out. After 10km we saw signs for what looked like a shop, but it was just a guesthouse who’s logo was a bike and some tools, really useful. 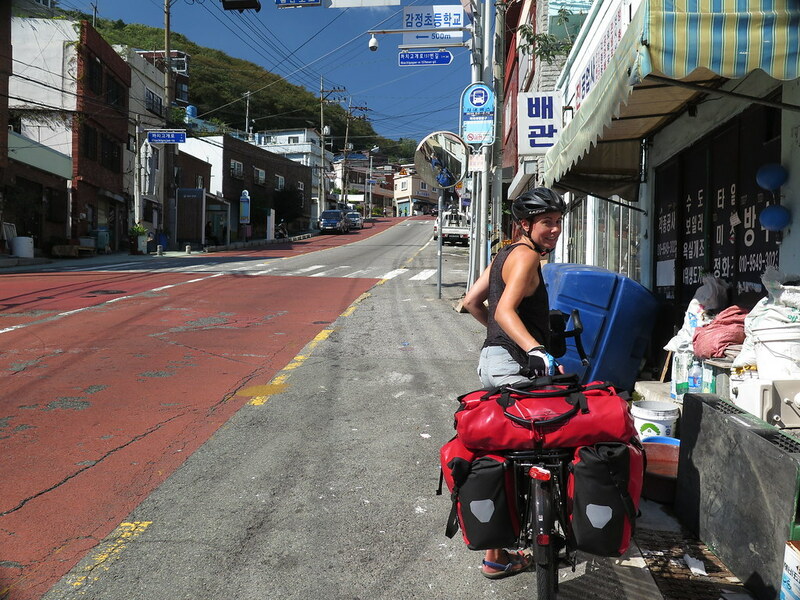 A little further on, around 30km, we got into Jeomchon and one of the first shops we passed was a large bike shop. The mechanic could understand a little English and used his phone and Google Translate so we could just about understand each other. He had a good look at the rim and said he couldn’t see anything wrong. But he put in another tough layer of rim tape which he said would reinforce things and help prevent more flats. He also gave our bikes a good check over and generally reassured us that he knew his stuff. 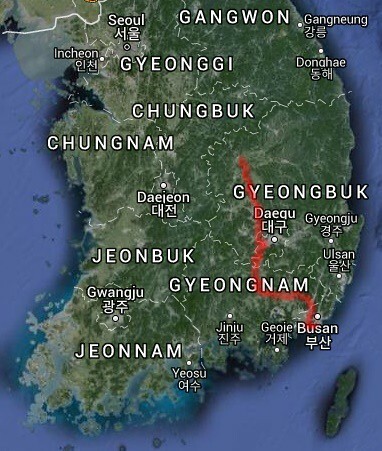 We’re still not convinced, but hoping that it’ll hold until we get to Seoul. We decided to hang in Jeomchon for the rest of the day and get a hotel. It’s a really nice town that we would never have come through had it not been for the tyre. The hotel we decided on is a love hotel, but that’s really not as seedy as it sounds! We stayed in one a couple of years ago in Korea and they’re a cheap option with huge rooms with great facilities. Just don’t get too curious when you’re flicking through the tv channels. (Or do, if that’s what you’re after.) It’s cheaper than our last hotel in Japan, but the room is about 3 times the size! So, so far, Korea has been up and down! The cycling itself has been beautiful, although with some tough hills at times. The people have been incredibly nice and helpful even with then language barrier, and the weather has been perfect. It’s just frustrating that so often the enjoyment has been marred by a simple problem that we just haven’t been able to get to the bottom of. We’re a little more than halfway along the path and despite the delays, we’ve been making good progress. 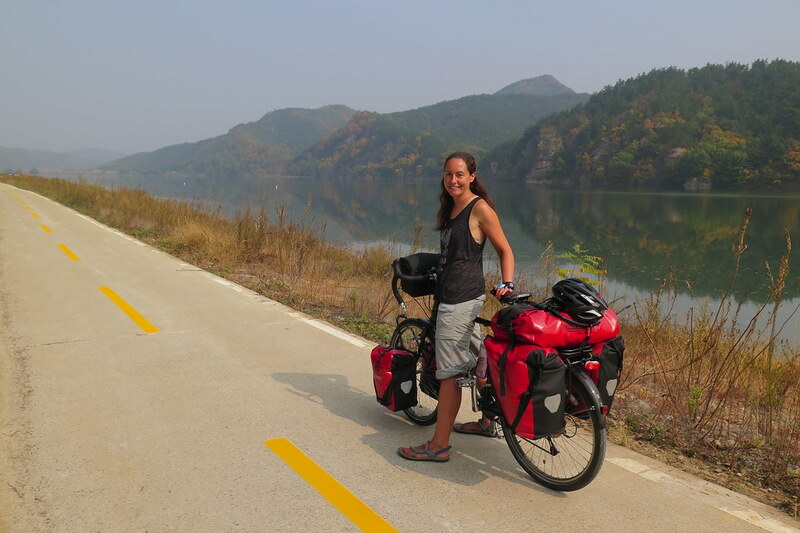 Hopefully from here on the tyre will hold and it’ll be smooth riding up to Seoul. Hey guys! 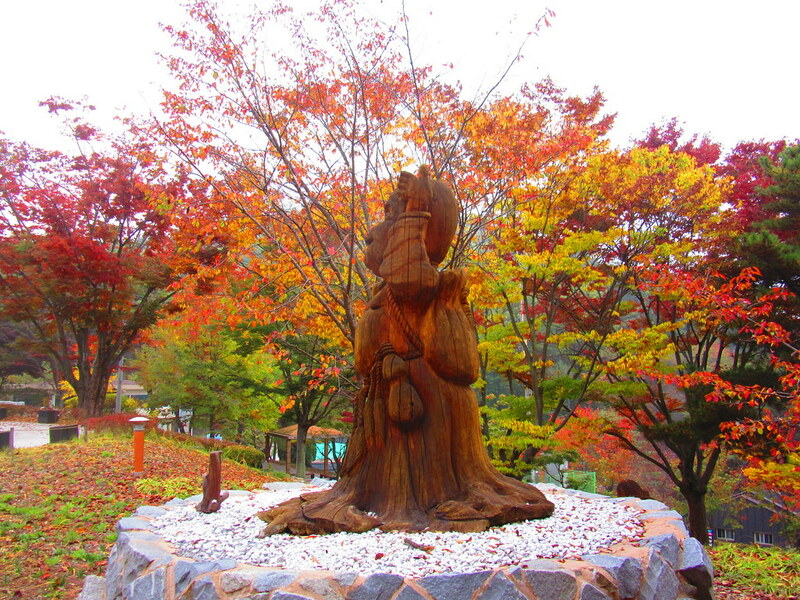 Eek not in Japan anymore… Korea looks beautiful! And Clarey is that a skirt I spy?! How can u manage to look glam living out of a tent? Impressive!! Hope u get to the bottom of the tyre issue soon. Yep! It has been quite annoying! I guess the helmets depend on if we’re on busy roads or not. The riding here has been largely on cycle paths so we haven’t worn them. And of course if we’re posing for a photo, the helmet comes off! I’m sure you cant just keep chucking money at problems Andy, but maybe just time for a new wheel ? Anyway, i’m sure you’ll find a solution and Korea looks wonderful. Thanks Mark. Yeah, it’s looking like that’ll be the likely solution once we get up to Seoul. We don’t really want to be setting off into China with an ongoing niggle! 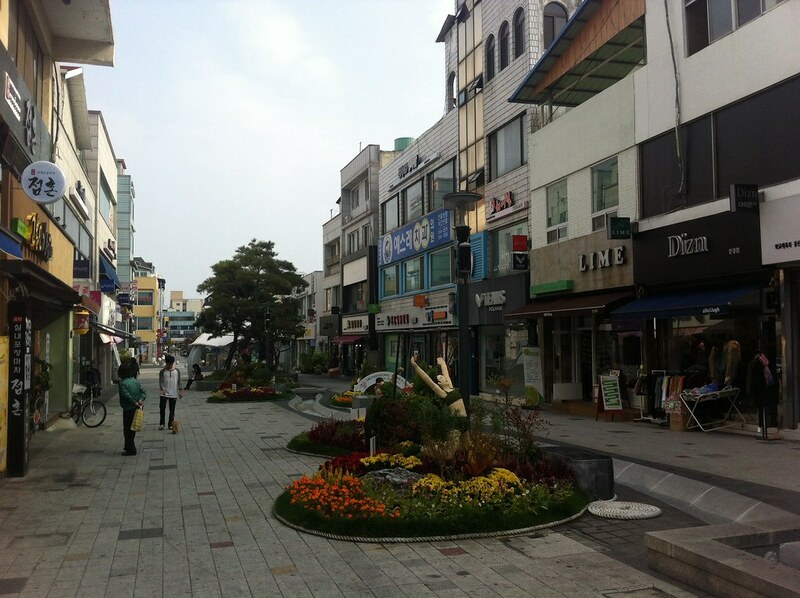 But other than that, yep, Korea is great! great to read about this route that we did not long ago ourselves…. we recognise lots of the photos – especially that big bloody hill (totally unnecessary). I wonder if you tried replacing the rim tape completely? Sometimes our rim tape has gone brittle over time and caused “pinches” on the tyre. Hi Gili! Thanks for the comment. 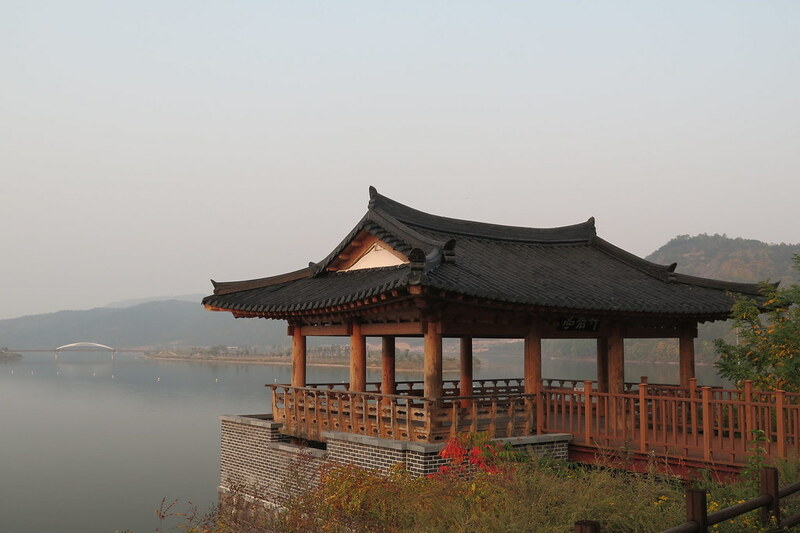 Have been waiting to read your blog post about Korea! Glad you made it to Busan. Further north the colours in the trees were really beautiful coming through the mountains, what a beautiful country! I hope you have a great time in Japan!